Ocular choristomas are uncommon lesions chiefly presenting in children. Choristomas may contain dermal and epidermal components, muscle, cartilage, bone, etc. They are usually seen in epibulbar conjunctiva, but epipalpebral location is uncommon. We present a case of epipalpebral chondroid choristoma presenting in an adult patient. Choristomas in palpebral conjunctiva are rare. 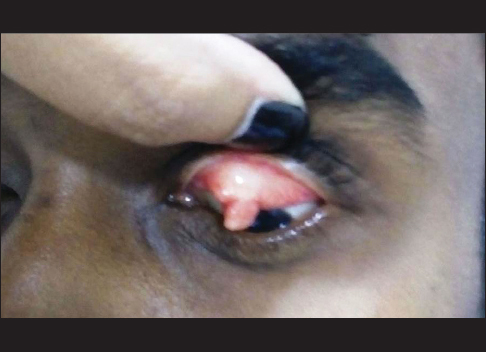 These may present as a sessile or pedunculated protruding mass from palpebral conjunctiva. Choristomatous elements may be composed of adipose tissue, adnexal structures, chondroid, or osseous tissue. Osseous elements have been reported in epibulbar location. Chondroid elements in palpebral choristoma are extremely rare. We present this case for its rarity. A 34-year-old male presented to the ophthalmic clinic with a gradually increasing left palpebral conjunctival swelling of 4-year duration accompanied by irritation and redness of the eye. There was no history of previous trauma. On examination, a nodular pedunculated polypoidal mass was seen over the left eyelid on the palpebral aspect which was clinically diagnosed as chalazion [Figure 1]. The mass was excised and sent for histopathology. On examination, the tissue was well circumscribed, gray white, firm and measured 0.8 cm × 0.4 cm × 0.3 cm. 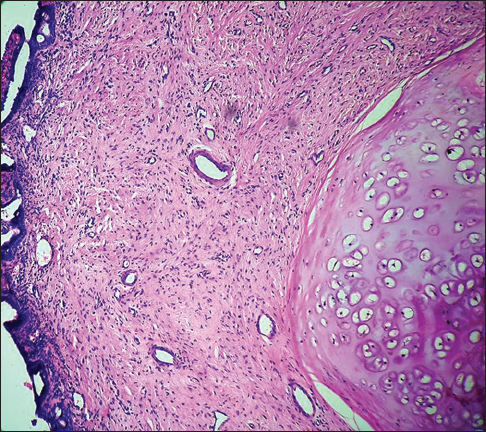 Histopathological examination revealed well-demarcated area of mature hyaline cartilage comprising mature chondrocytes within lacunae within a matrix of hyalinized ground substance. The overlying conjunctival lining was normal. No other tissues such as dermal adnexal structures, osseous, or lacrimal were identified within the lesion. A histological diagnosis of chondroid choristoma of the palpebral conjunctiva was made [Figure 2]. Choristomas make up about 3% of all conjunctival and corneal tumors. Although choristomas can be seen in any age, these are common in children and are the most common epibulbar and orbital tumors among them. Elsas and Green reported 33% cases of choristoma in their case series of 302 cases of periorbital tumors in children. Ocular choristomas are most frequently epibulbar and located in the superotemporal quadrant near the superior and lateral rectus muscles. Epipalpebral location is rare. Ocular choristomas contain a variable proportion of epithelium, dermal adnexa such as pilosebaceous or eccrine glands, adipose tissue, fibrous tissue, cartilage, bone, smooth muscle, and neural tissue. Depending on the predominant component, they have been variably named as dermoids, dermolipomas (lipodermoids), and complex choristomas. Dermoids contain a significant proportion of epidermal and dermal elements, dermolipomas contain predominantly adipose tissue and dense collagen tissue, and complex choristomas contain a significant proportion of cartilage, bone, smooth muscle, lacrimal tissue, etc. Orbital osseous choristoma has been reported, but those showing purely a cartilaginous component are rare.,, Microscopy of these revealed nodular islands of mature chondrocytes in a myxoid matrix. Usual clinical presentations are irritation, redness, and visual disturbance., It may present as a single, subcentimetric flat lesion, or a large mass filling most of the epibulbar regions. Choristomas are sometimes familial and may also occur in association with coloboma, Goldenhar syndrome, or epidermal nevus syndromes; those associated with the latter are often bilateral and extensive. The differential diagnosis includes chalazion, epithelial inclusion cysts, dermoids, dermolipomas, pyogenic granuloma, and papilloma. Our case showed a well-demarcated, subconjunctival mass composed of mature hyaline cartilage with scattered mature chondrocytes of varying sizes interspersed between amorphous matrices of hyalinized ground substance. Choristomas have to be differentiated from chalazion which shows lipogranuloma composed of central fat with surrounding lipid macrophages and giant cells. Ocular dermoids show fibrous tissue and skin appendages. Dermolipomas have abundant mature adipose tissue with minimal skin appendages. Epithelial inclusion cysts are lined by stratified squamous epithelium and contain keratin material. Very few cases of cartilaginous choristoma are reported in epibulbar region,, whereas in our case the location was in epipalpebral conjunctiva with cartilage as choristomatous element. Epipalpebral cartilaginous choristoma is a histological curiosity. Although this may clinically mimic various benign tumors in children and occasionally malignant neoplasm in adults, it has a very characteristic histology and this should be kept in mind to make a correct diagnosis. This should also prompt a careful search for other associated sequelae of associated syndromes. Mansour AM, Barber JC, Reinecke RD, Wang FM. Ocular choristomas. Surv Ophthalmol 1989;33:339-58. Bansal R, Trivedi P, Patel S. Cartilaginous choristoma of the tongue – Report of two cases and review of literature. Oral Oncol Extra 2005;41:25-9. Elsas FJ, Green WR. Epibulbar tumors in childhood. Am J Ophthalmol 1975;79:1001-7. Ortiz JM, Yanoff M. Epipalpebral conjunctival osseous choristoma. Br J Ophthalmol 1979;63:173-6. Garg N, Panikar N. Epibulbar dermolipoma. Indian J Pathol Microbiol 2013;56:477-8. Ringeisen AL, Wei LA, Lucarelli MJ. Orbital choristoma. Ophthalmology 2015;122:1614. Shields CL, Qureshi A, Eagle RC Jr., Lally SE, Shields JA. Epibulbar osseous choristoma in 8 patients. Cornea 2012;31:756-60. Mauriello JA Jr., Voglino JA, Otazo N. Cartilagenous choristoma of the eyelid tarsus. Am J Ophthalmol 1988;105:563-5. Sharma V, Varma P, Vaidya S. Bilateral lipoderma in adult. A rare case. Internet J Ophthalmol Vis Sci 2005;4:1-4. Grob SR, Jakobiec FA, Stagner AM, Colby KA. Diffuse epibulbar complex lacrimal-cartilaginous choristoma: Diagnostic clues and management. Cornea 2015;34:1321-3.